Greengate Farm is the perfect place to bring all your family members, even the four legged ones. If you can’t stand leaving your dog when you go on vacation, bring your pup along with you. 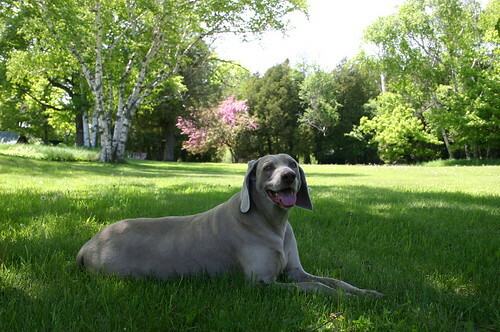 There is a lot of room for your best friend to run around, play fetch, or take a nap under a tree. All accommodations are a short walk to our private rock beach, so you and your pooch can go for a refreshing swim in the hot summer months. Our Resident Farm Dog’s name is Ivan, and he is very friendly but old and shy. He spends most of his day napping inside the farm house keeping Susan company or hanging out with George in the Ham Shack. The newest addition to Greengate is a young Vizsla named Bo’sun. He was born in a puppy mill and neglected by his initial owners. At only 4 months, he was left at an animal shelter in Illinois with a mysterious scar on his back. Bo’sun is very energetic and friendly. He loves playing with Ivan and all the K9 guests at Greengate Farm. He is usually bounding around the grounds with seemingly endless energy. We think he is very happy in his new home and we are happy to have him as part of the Greengate Family. Bo’sun, Ivan and visiting dogs all play off-leash at Greengate. 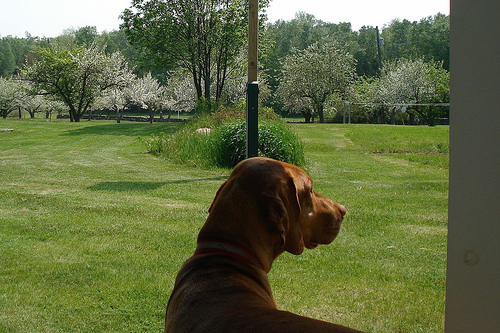 Well-mannered and vaccinated dogs are welcome at Greengate Farm. Greengate Farm staff must be advised of any pet(s) that will be accompanying you when your reservations are initially placed. Pet owners must be able to provide proof of current vaccinations upon request. Please be sure to bring the necessary paper work from your veterinarian for every pet in your party. Dogs are free to swim off our beach, run through our woods or simply lounge on our lawns. Please be respectful of other guests and their dogs; have a leash on hand just in case. Unfortunately, dogs that are not 100% house broken are not allowed at Greengate Farm. In order to keep the dogs visiting Greengate Farm safe, please adhere to the 15 MPH speed limit on the driveway. Lawn speed limit – 5 MPH. Thank you.